In some remote villages in the eastern part of the coastal area one of the main problems is the provision of adequate supply of water both for the increasing population and growing agriculture needs. Most of the villages are connected to the electricity grid. However; in some villages electricity connections to the water wells do not exist. As a result many of the local wells operate inefficiently as they rely on the use of diesel pumps. Diesel pumps have high maintenance costs and are not particularly environmentally friendly due to oil leakages that pollute the soil. Furthermore, many wells are currently not being operated mainly due to the high operating costs. Photo 2: Electricity poles have been mounted and a chamber for the transformer (foregroud) has been constructed. In two districts, the ground water layers can be found at a depth between 90m - 100m, which in turn means that water pumps are the only method of getting the water to the surface. The existing pumps operate about six hours a day in order to supply sufficient water. The water potential would permit a doubling of the area under cultivation, creating further employment in the villages and contributing to the ability of the local population to become more sedentary. A project on how the existing water supply system could be improved was developed and implemented. Essentially, a connection to the main 11KV electricity grid was established and a transformer that reduced the voltage down to 380 V was added (three-phase current). This is the most appropriate voltage required for powering the electric water pumps. The beneficiary groups had to cover the costs of the buildings housing the transformers as well as the connections between the transformer station and the wells. In general, a transformer station serves four to six wells at a distance of up to three kilometers. In addition, if new wells are drilled, the wells and pumps are to be fully financed by the beneficiary groups. Upon completion of the project, the operation costs of the wells were reduced by over two thirds compared to the use of diesel pumps. 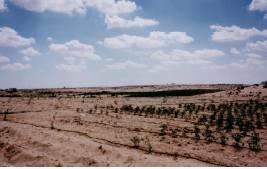 The water supply for irrigation purposes was significantly improved and in some cases additional irrigated areas were put under cultivation. During the planning process of the project, the project planning matrix methodology was used (see PPM). The method proved useful not only to systematically plan the water wells electrification project but also other small projects that have been implemented. In order to secure the timely implementation of activities, the PPM was further elaborated in a separate plan of operations (see PoO). The plan of operations also provides the basis for the monitoring system that has been applied to most of the projects planned.